Jen is at work so I hacked her blog (didn't know the password so I reset it!) She has a bit of catching up to do (about 1000 pics on memory cards but no updates on the blog!) 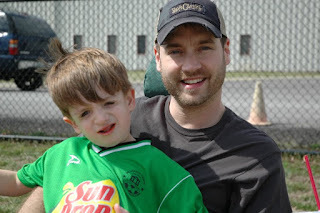 I was looking through some and had to post Andon's first soccer game. First off, I need to paint the picture here. The team has eight kids so to make it fair and fun they only let 3 kids play at a time. This creates a three on three situation. 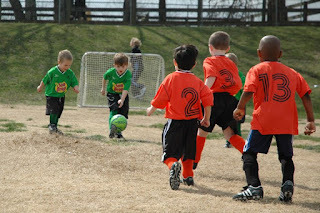 During practice the coach said at this age they just want to make it fun and get the kids used to the "idea" of soccer, no keeping score (I look over at Jen and whisper "Oh, I'm keeping score" It's a guy thing...lol). Anyway, they rotate the kids in and out to give them all playing time. Our team is a notch below the bad news bears, seriously. We have one kid who is actually real good but... If the ball gets taken away he runs, jumps in the air and slams to the ground crying (this is the coaches kid). He repeats this approximately ten times a game (sooo funny). We have another kid who watches his mom for instructions (will stand in the middle of the field, action going on all around him and will freeze to see what mom says next) and then we have Andon. Andon will break out into dance for no apparent reason, make funny faces until someone acknowledges he's making a joke and at times play soccer. The first game was six kids huddled around a ball, the ball disappears in the group and then suddenly pops out. The kids realize they are not huddled around the ball, all heads look up to find it and then it's a mad dash towards the ball again. This repeats itself for about thirty minutes. The first game was really fun, all the kids thought they were superstars and the parents enjoyed the time as well! Oh, and the score was 6 to 2 in favor of the other team! Michael used to pretend he was a bull and put his fingers up by his head for horns and run all around the field - not caring at all about the game. Sarah chased grasshoppers...Matt loved the uniform...don't you just love how innocent they are and how they don't get the whole competition thing yet? So cute. That is so funny! 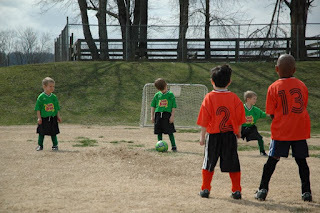 Totally reminds me of TBall with Bradley.... Mat kept score, too :-) GREAT PICS!!! 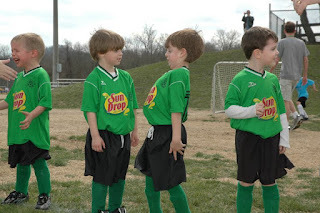 What a fun way to learn soccer. I love that you had to reset Jen's password!